Congratulations to all 3 winners. You can expect your coupons soon. 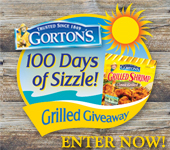 Until September 7th Gorton’s seafood is celebrating 100 Days of Sizzle with some awesome prizes. Grand Prize Winner (one each month) will receives a sizzlin’-hot Beach Bag Prize Pack including: a custom Gorton’S Second Wind Sails tote – made by the Gloucester company that stitches beautiful totes using recycled sails –packed with an Amazon Kindle 3G,an Amazon Gift Card,and a Gorton’s Fisherman Beach Towel ($400 value)! 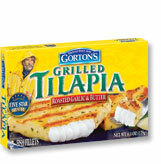 10 Daily Winners will receive Gorton’s Grilled Seafood free product coupons. For this review I received some Gorton’s Seafood coupons so we could try out what was new. I have worked with Gorton’s before in the past and I have yet to be disappointed. From the grilled shrimp to the battered and grilled fillets, I love that these provide not only a healthy but also a quick dinner option. Want to try Gorton’s for yourself? 3 lucky Yellow Tennessee readers will win 2 coupons good for any free Gorton’s Seafood product. Mandatory Entry: Go to Gorton’s website and tell me one of their products that you want to try. * Like Gorton’s Seafood on Facebook. * Tell Gorton’s that Yellow Tennessee sent you their Facebook wall. * Become a Follower of Yellow Tennessee. * Follow Gorton’s on Twitter. * Tweet about this giveaway. Gorton’s 100 Days of Sizzle! Win Free GRILLED Seafood! @YellowTennessee http://yellowtennessee.com/?p=1950. One entry per day. Entrants 18 and older and from the US are eligible. Contest Ends on August 8, 2011. Winners will be chosen by And The Winner Is and announced around August 9th. Winners will be notified by email with “You Have Won the Gorton’s Seafood Giveaway” in the subject line. Winner will then have 48 hours to respond before a new winner is chosen.